One of the first poems I remember learning is John Masefield's "Sea Fever." I lived in the interior and very rarely saw the sea. The rhythm and longing in the second stanza awakened in me the desire to spend time beside the ocean. I couldn't imagine being on it. My first extended time at the sea was in Ecuador, where we traveled from our home in a small jungle town, up, up, up and over the Andes Mountains, then down, down, down steep and winding roads to the beach. At first, I didn't like it very much. I was used to northern lakes, limpid morning and evening, where the haunting cry of loons echoed in the still quiet. In contrast, the ocean was never quiet. Waves rose and fell unrelenting against the sand and rocks, restless and noisy. I was never quite certain where the water would be when I woke up in the morning. Was the tide high or low? However, as with many unknown things that become known, I learned to love the ocean. It's very restlessness became calming. I found the incessant surging and falling relaxing and spent hours on the beach alternately reading and looking at the sea. We now live on a small peninsula on an island in the Pacific Northwest. We are surrounded by sea on all sides; the furthest water access is 24 km and the closest, 3.5 km from our home. On Saturday I had enough with puttering around the house. There is always more to do and I was tired. School has been challenging this term, now ended. The wind flapped in great gusts around the house. Trees swayed and the occasional bits of debris danced down the street. 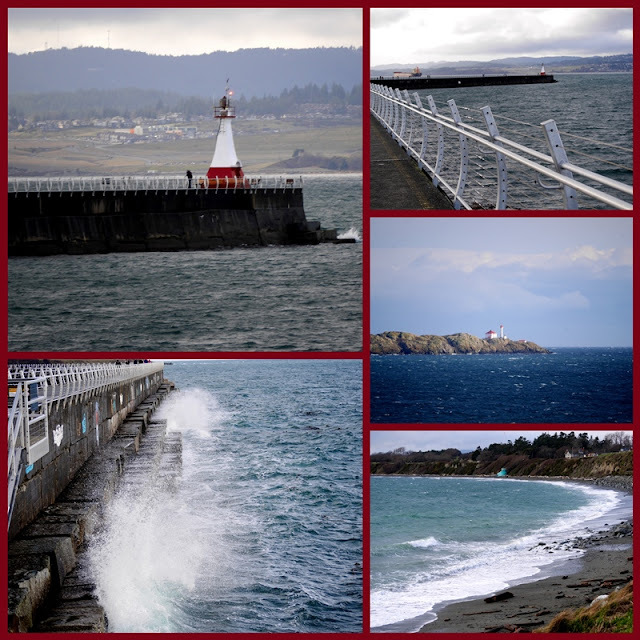 "Let's go to the breakwater," I suggested to Tim, and off we went. The waves crashed and occasionally flung up hard bits of spray as we walked out to the lighthouse. 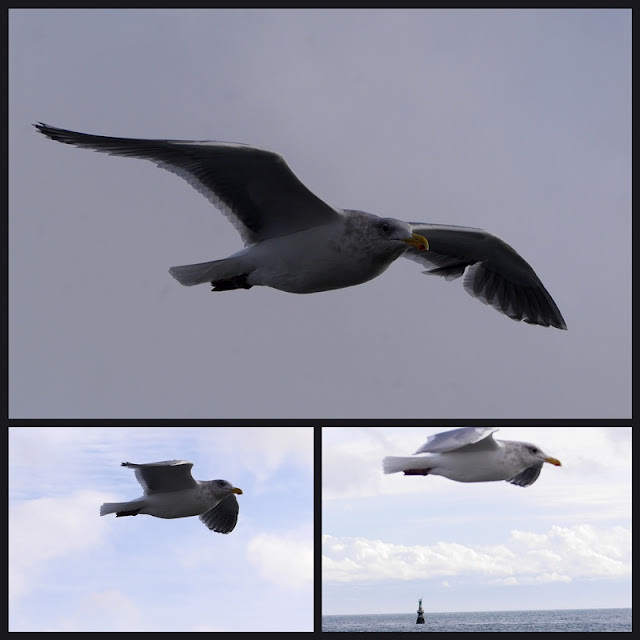 The gull mosaic photos are all of the same gull, balancing against the wind before finally shooting upwards to catch the updraft. We then drove to Clover Point to watch the wind surfers scoot along the surface, then catch wind and wave and fly through the air. Exhilarating. 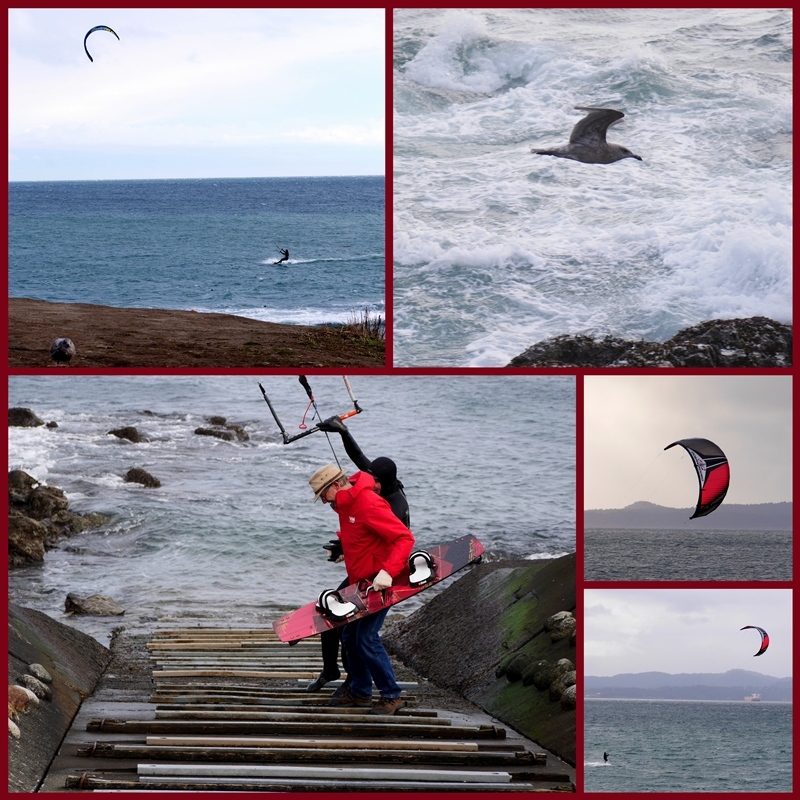 As we walked back to the car, we observed one wind surfer coming ashore. He carried his board and hung onto the high-flying kite. The kite needs to come ashore to land on ground rather than water for easy retrieval. Tim noticed the difficulty the wind surfer had in managing kite and board and offered to help. He carried the board, then held the man's hand as he struggled to stay on the ground and pull the kite ashore. Together they made it and brought the kite down safely. Still not ready to return home, we drove up to Gonzales Park, to enjoy the expansive view. The long skinny point of land is Clover Point, where the wind surfers played. While enjoying the view a group of tartan clad runners gathered. I asked one of them what this was about and he said it was a Robbie Burns Run. He defined the group as a "drinking group with a running problem." When I asked if they would be enjoying haggis afterwards, he said, "for those who eat the flesh, yes." I don't think he was one of them. The fresh air, wild wind, and choppy seas cleared our heads and we headed home perfectly satisfied. I hankered after rye crisps with butter and honey, along with tea, and we settled down by the fire, replete in every sense. I have always loved John Masefield's poem! Smiling at the tartan clad runners...and wondering how they fared with their kilts in the stiff sea breeze. As for haggis...I am definitely a vegetarian on Robbie Burn's Day! What a wonderful day you had. I adore the ocean in stormy weather, and your snack afterwords sounds perfect. I've enjoyed the stormy weather we've had - but now I'm ready for some spring and flowers. I can't imagine a better place to head off too when you need to be out of the house and in the fresh air. Beautiful scenery, fabulous seagull images, a little bit of an adventure whilst aiding a stranger and tartan kilted runners all be before teatime, what a day! LOvely! I too enjoy being near the sea and love to be near it in winter or stormy weather and to know that it is more powerful than mankind. I also love it in summer when the wavelets gently lap against the pebbles or run across the sand. It is something that lies deep within our genes the evolutitonary home of our species half forgotten but something that we crave at times. Especially good followed by honey for tea and a warm fire! My kind of tour Lorrie, I love the sea been surrounded by it myself. Although like you living so close I love the beauty, I am well aware of the dangers too. Lovely post. I do so love the sea, Lorrie, and the restorative forces I find there. You are blessed to be so close to the ocean as you are now. Love the pictures. Wonder if they are paying tribute to Robert Burns-the poet? Betting that is so. What a day "away"! Down to the sea ... one of my favorite places. Thanks for reminding me of Masefield's poem. Happy Monday! I remember memorizing Sea Fever at school. I enjoy the changing tides of the ocean and walking on sand bars. Your photos are lovely. My usual habit when reading posts is to browse through the photos first. When I got to the picture of Tim, I had two words forming, “Nooooo, Tim!” Good thing I read what that was all about. So here I thought I’d enjoy a poignant reading of how romantic the sea is, but instead it turned into quite a bit of excitement for one afternoon from Tim’s rescuing a flying kiter to kilt-clad runners celebrating Robbie Burns Day, haggis and all. Sea Fever was my grandmother’s favorite poem. She always felt the pull of the ocean and sometimes it was the smell of the sea that she most wanted. I get that way from time to time. Good thing, the ocean is only thirty miles away. Still, I am more a “Once More to the Lake” girl myself. Glad you headed out to the sea. Beautiful description of what you saw and felt. I learnt Masefield's poem by heart whilst at school. His words generate such strong feelings about the sounds, smells, and sights of the sea within most who have read it. Curiously he too grew up well away from the sea in Ledbury, Herefordshire, and his first experience of the sea was also in a S. American country which was Chile. I love being down by the sea, a place where I can almost hear God speaking. I don't get to the shore as often as I like and will get there even less once we move farther away from the coast. Beautiful photos and I love the poem! Have a great week, Lorrie. How fortunate that Tim was there to help out the kite surfer ... a local hero! I had a fit of the giggles over the kilted men. If I didn't know better, I would think they were a group of my hubby's friends! I hope you have a 'bonny' week! Lorrie, What a wonderful day filled with many interesting scenes and people. Love the kilts. Thanks for sharing. Sylvia D.
What a wild amazing place! Your pictures are great. A drinking group with a running problem...Gotta love that. Loved the poem and the sea. So happy you were in the right place so your Tim could help the wind surfer. That sounds like a strong wind. I could learn from you . . . going on a nature adventure instead of doing one more chore. Beautiful words to go along with your photos. Looks like a lovely time. ❤️ the Robbie Burns run! I echo your sentiments as there is always more to do. Love seeing the kilt cladded runners. Have a beautiful week! Oh Lorrie, I love that you felt the pull of the sea, and left the chores of home behind. I love to live through you and Tim and the adventures that you take. What a blessing for you both, which keep those memories a treasure. Have a beautiful rest of the week. I loved this ode to the sea... both power and serenity ... it is mysterious the draw it has on us. You live in a perfect place to be able to go there fairly easily! The kilted runners brought a smile. The Robbie Burns run made me smile. Happy First Day of February! Hi Lorrie, what a fabulous post! As per my usual habit, I scrolled down and looked at photos first to get a sense of what the post was about (I also just love looking at photos). The ocean photos were beautiful and peaceful (I love the ocean) and then I saw a man and a kite surfer and then a bunch of people in kilts. I became intrigued and couldn’t read fast enough to know your story. You certainly had a fun day.